Can you believe we're in November already? Doesn't seem that long ago since DH and I took our eldest Peter for his first day at full time school. The weather has definitely changed, lots of rain in the past couple of weeks and the cold spell is now here. 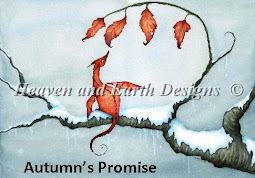 Here's my November calendar piece and the verse just sums up the weather here in Yorkshire. And last but definitely not least here's my progress on my latest project. Return to the Sea by The Sampler Girl. I've only the quote at the top to sew then I can finish it off. I'm thinking hand stitch the sides with co-ordinating thread, back it and make it into a wall hanging. Love your progress on the Jane Austen piece. The blue colors are so beautiful and vibrant! Jo, your November pieces are so cute and say it all when it comes to this beautiful season. Return to the Sea is looking good too. Love the calendar verse - lovely stitching and progress on these! The calendar really IS November! Nice job on all! 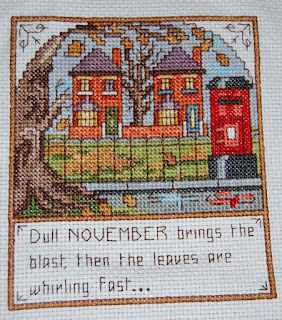 Jo I just love the colours and the pattern of your November Calendar verse. Lovely stitching on all the pieces. Loving your jane austen piece - can't wait to see that finished. I'm with you on not believing it's november already - i reckon i've missed a couple of months along the way! Your pieces look great! 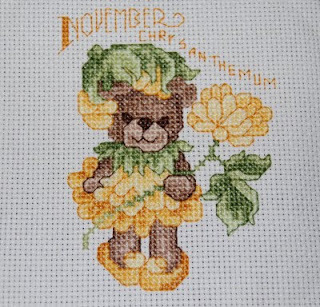 Love your Jane Austen piece and your November piece is great too. The sentiment reflects our November here too.